Mobile is maturing right before our virtual eyes. Today, Covario – a search marketing firm – released its Global Paid Search Spend Analysis for the first quarter of 2014. One of the key findings of the study was the rise of paid search advertising on mobile devices, which it counts as smartphones and tablets. Mobile search spend increased 135 percent year-on-year and 35 percent versus the last quarter. 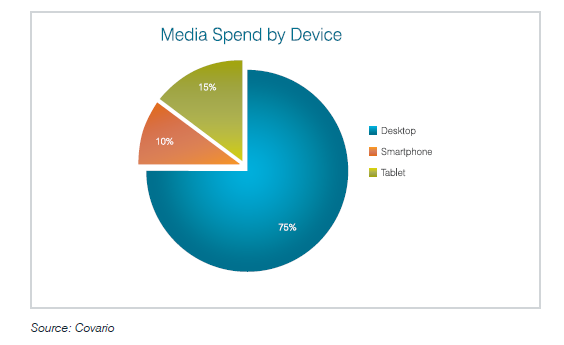 Additionally, Covario reports that mobile platforms now represent 25 percent of all paid search spending (see image). The study found that global cost-per-click (CPC) inflation overall rose 12 percent in the first quarter from the same period last year and three percent from the prior quarter. Study author Alex Funk, director of global paid media strategy at Covario, attributed this to “maturation of the mobile landscape,” as well as search engine moves toward larger ad formats and new advertising extensions stemming from last year’s roll-out of Google’s Enhanced Campaign initiative.